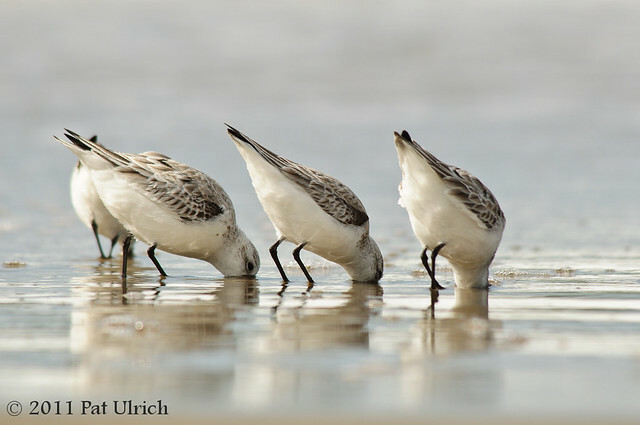 Sanderlings dig deep into the sand looking for a meal after a wave pulls back along Limantour Spit in Point Reyes National Seashore. 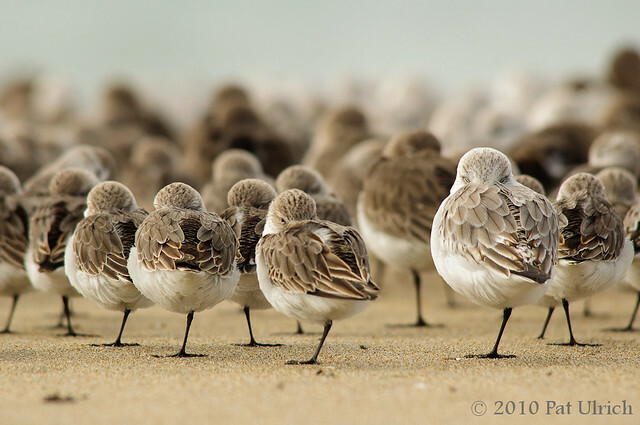 View more images of shorebirds along in the beach in my Limantour Spit, Point Reyes National Seashore Gallery. 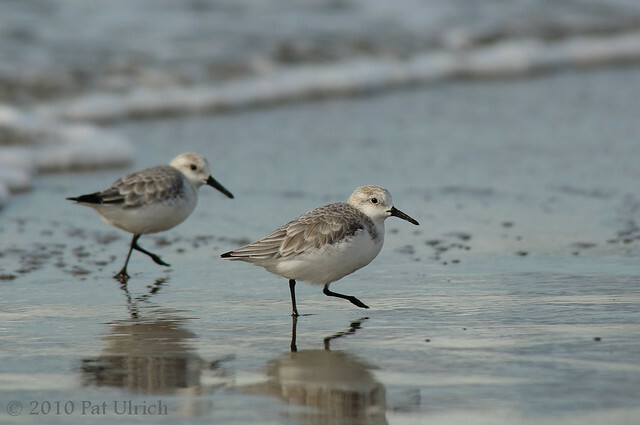 Two sanderlings running away from the waves on Limantour Spit at Point Reyes National Seashore. 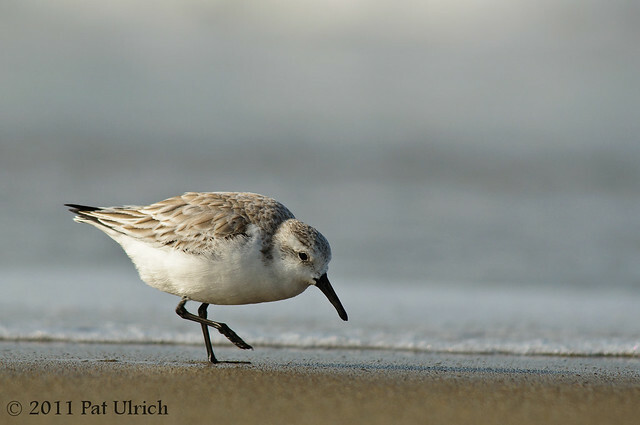 A sanderling walking the water's edge on Limantour Beach, Point Reyes National Seashore. 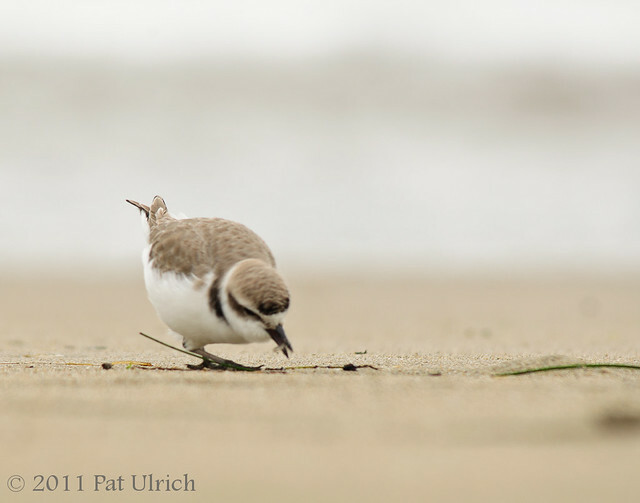 Just a quick post of this cute little snowy plover sitting in the sands of Limantour Beach in Point Reyes National Seashore. 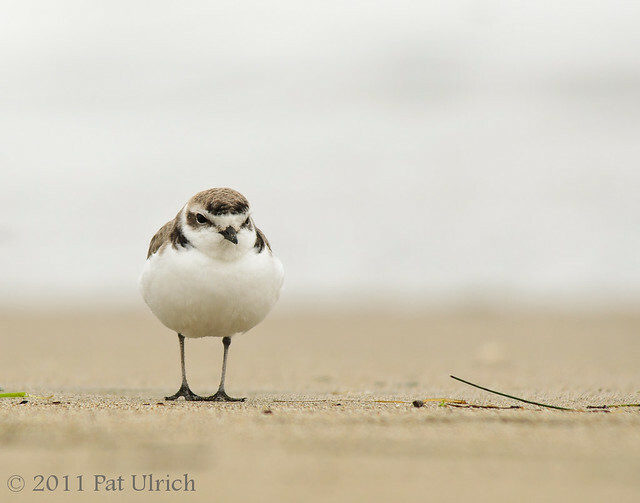 This shot is from an awesome hike I took along the beach last November, when I was able to spend time with a group of western snowy plovers, a different group of semipalmated plovers, and huge flocks of mixed sandpipers. 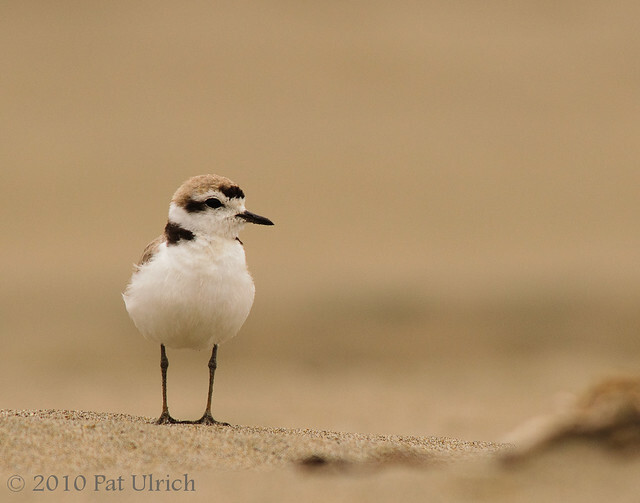 Snowy plovers are one of my favorite subjects to photograph, and Limantour Beach in Point Reyes National Seashore is a great place to find them. I took this series of images under a heavily overcast sky, but by dialing in some extra exposure, it almost looks like they were in a snowy landscape. 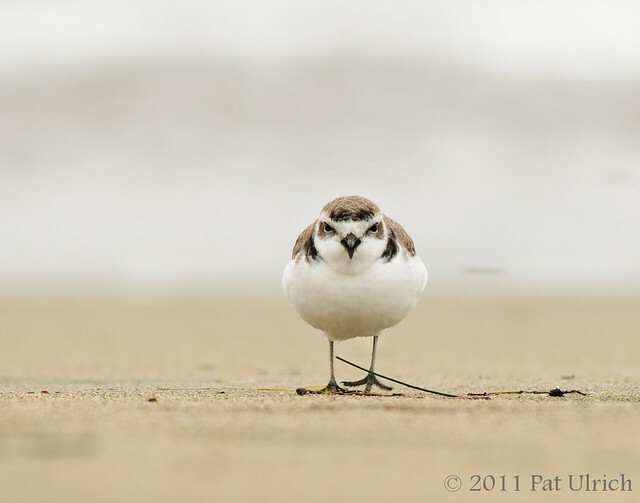 I like the attitude this bird is showing in this shot, with that foot raised while its calling out. I also thought that the straight on view is an interesting way to see them. The next two shots unfortunately didn't come out sharp, but I thought the captured behavior was interesting enough to share. In this shot it's preparing for a strike at an unseen prey item. And in this frame, it lunged through my plane of focus (you can see the tail feathers are sharp) to catch a small critter for lunch. Landscapes are certainly not my strength, although I'm making an effort to get better at them. It can be tricky though since I almost always have my wildlife lens (ie, 200-500mm zoom) on the camera to make sure that I'm ready if an interesting animal appears. But even a blind squirrel finds a nut once in a while, and it was hard to pass up an opportunity to shoot the gorgeous sunrise light falling on the sandstone cliffs of Drake's Beach in Point Reyes National Seashore in early January. 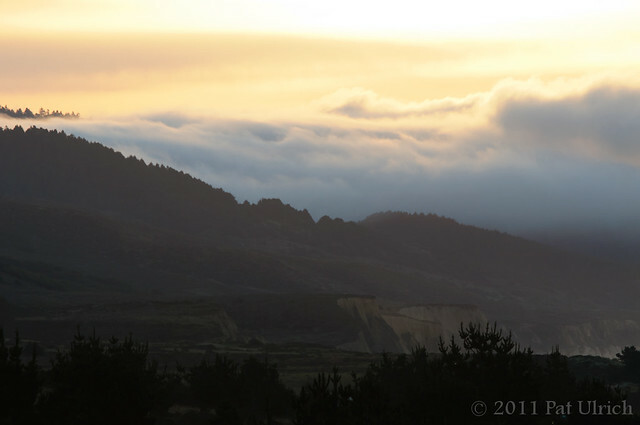 This particular sunrise was one of the most amazing I've ever seen, since most of the park had a fog bank hovering above it, except for the area I was in. Here's a second view, taken a few minutes earlier from the parking lot area (looking in the opposite direction). When I was flipping through the files I had already processed from this trip to pick one to upload for today, something new caught my eye in this frame. 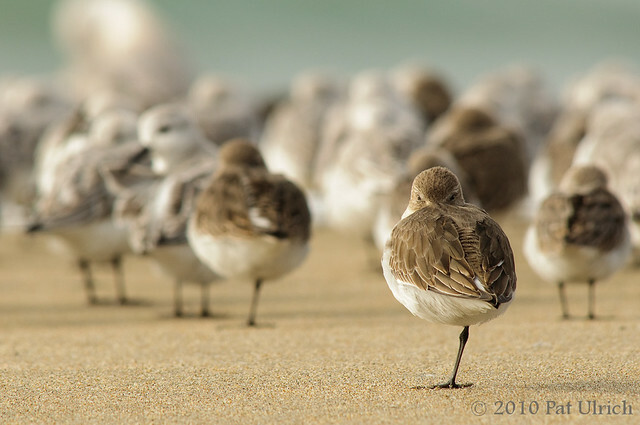 The tail feathers off to the side of the left-most sanderling actually belong to a second bird behind it. Other than a slight tilt in angle towards me, the front bird could have completely blocked out the back bird. Now I'll have to look through my archives again to see if I have a frame where this is the case. 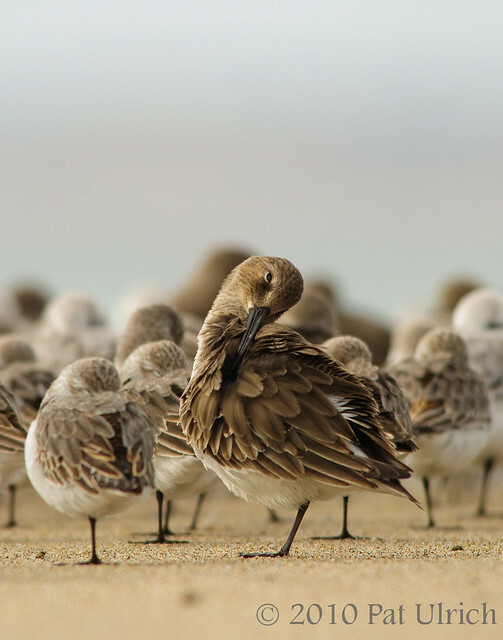 This shot is from an awesome morning spent at Limantour Beach in Point Reyes National Seashore with a huge flock of sandpipers. I also wanted to mention that Jim Goldstein posted the results for his annual blog project of 2010 Favorites. Over 160 of his readers submitted their personal favorite images of the past year (myself included) and he put together a list with a link to each one. 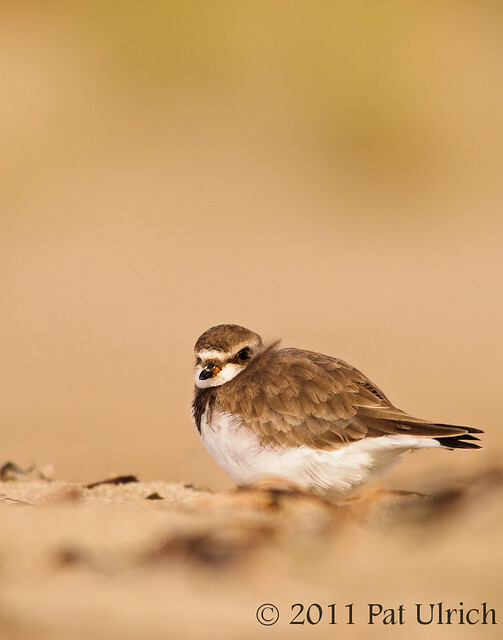 If you have some time and want to see some great images, its definitely worth checking them out! 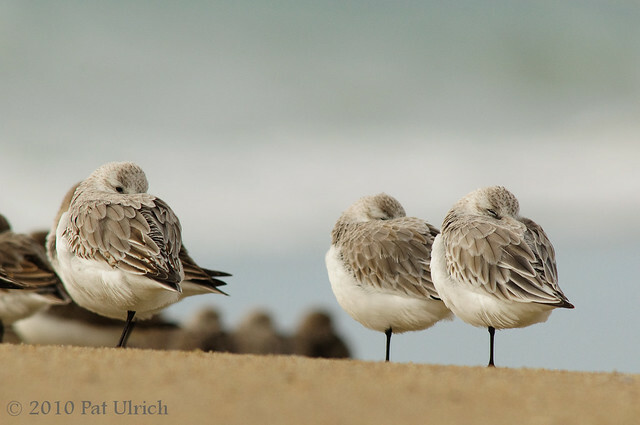 I always enjoy photographing preening shorebirds. 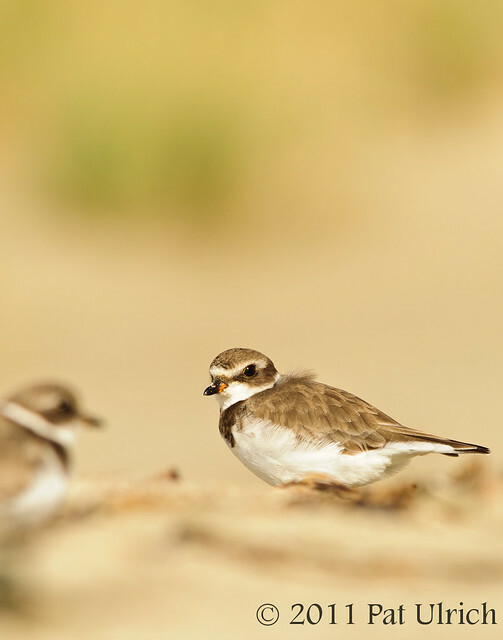 One reason is that its a good sign that the birds are comfortable with my presence, since they wouldn't risk taking their eyes off me if they weren't. 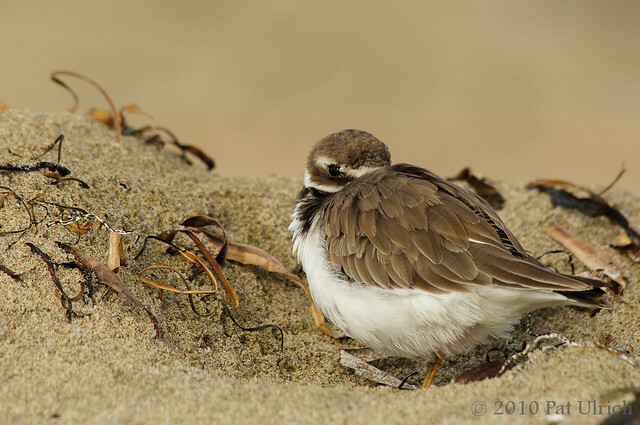 I never want to add extra stress to the birds that I'm watching, which means approaching really slowly while crawling in the sand, as well as leaving in exactly the same way when I'm done. And since the birds are ok with me being around them, I can get images of their normal behavior. Its wonderful to have a window into their lives. I also like preening shots since you can get more definition in each individual feather when they have them fluffed out a bit. 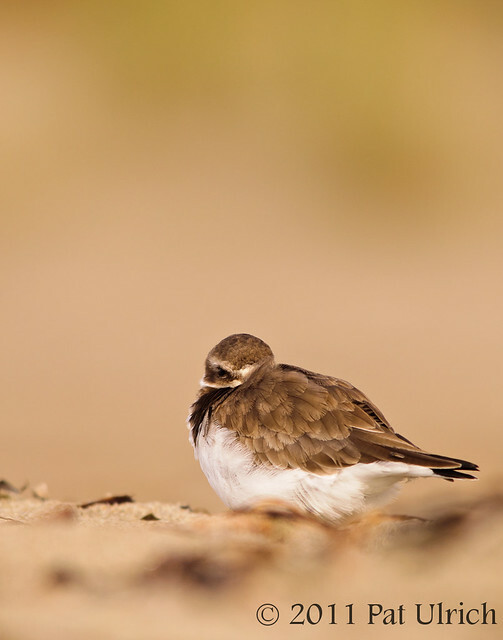 Its easy to see a bird's plumage as the overall pattern. But when they are cleaning the feathers, you can see the shape and detail in each one, and how they all fit together. 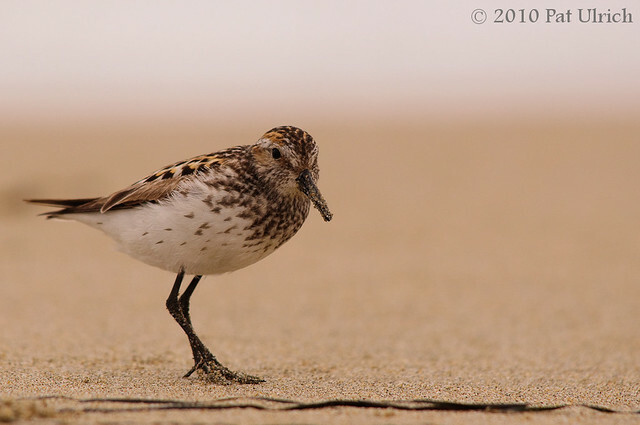 Here's a third frame that's pretty similar to the first, but there's a little better light on this angle of its face, and the little western sandpiper has an eye on the scene. 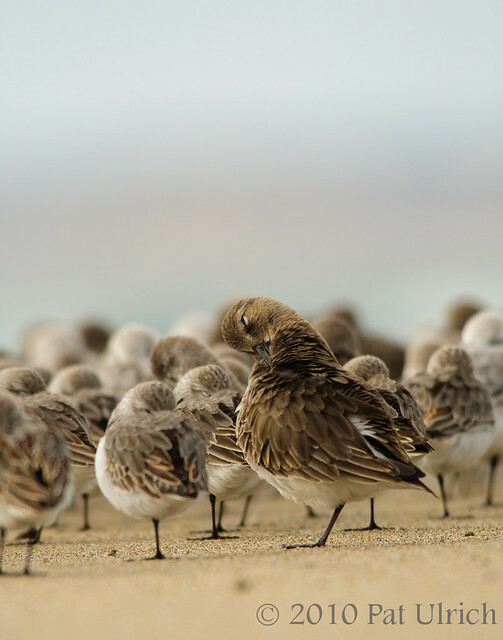 A dunlin on the outer edge of a large flock, keeping an eye on the approaching photographer. It's interesting how dynamic these group scenes are. 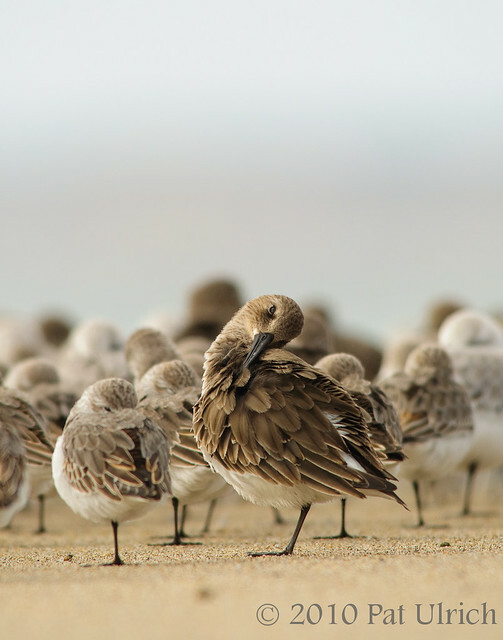 The birds were very interested in preening and napping, but the turnover of who was on the outside of the group was pretty high, with other birds constantly moving into the flock and being replaced by others. 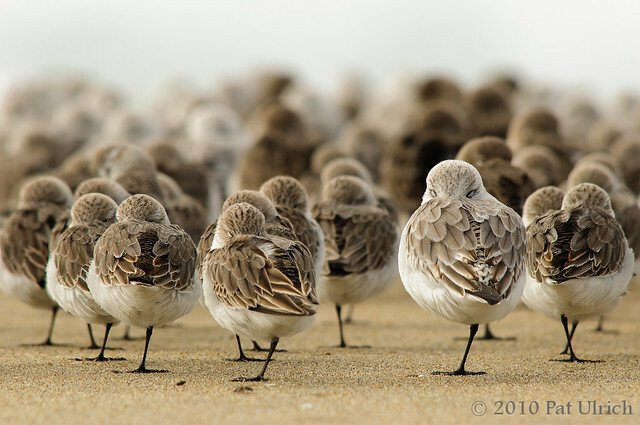 A sincere and heartfelt thanks to my "flock" of supporters who took the time to vote for my image in the 2010 National Geographic Viewer's Choice contest. The vote was supposed to close on December 15 (although the voting page appears to still be live, so I'm not sure when exactly its officially done). In the three days from when I first found out about the vote until now, over 550 new votes were tallied for my image. That is so awesome, and I can't thank you all enough! It's such an honor just to have been selected as one of the weekly choices from the contest submission period, and I still can't quite believe that I have an image on the NG site! I'm humbled and giddily excited! I'll be sure to post a link to the results once they announce the winners -- and if I happen to be among them, that would be incredible. But even in the likely event that I'm not, the quality of images in this contest is amazing and looking through the winners will surely be fun! So again, thank you all so very, very much! 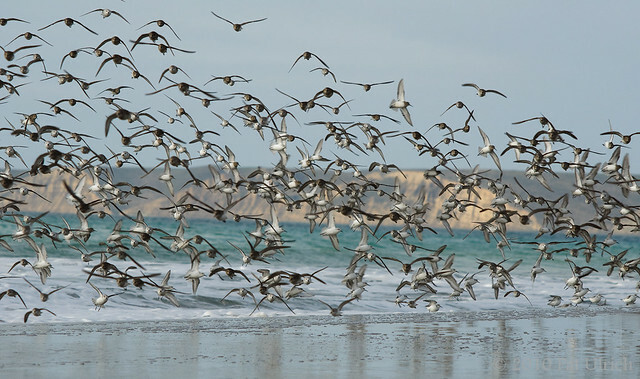 This shot is of the large flock of western sandpipers, sanderlings, and dunlin I saw cruising the shoreline at Limantour Beach in Point Reyes National Seashore. 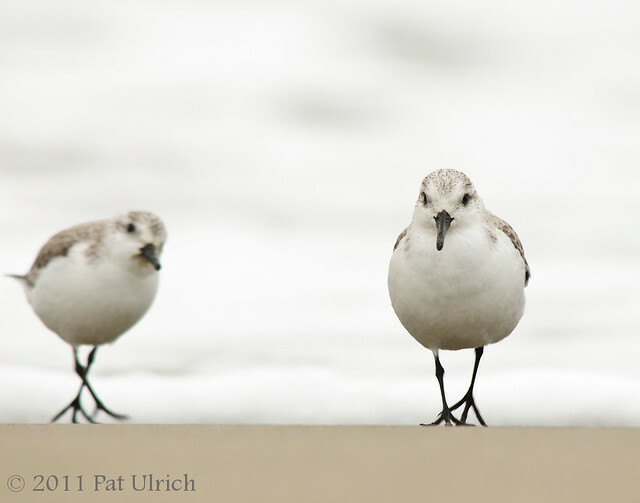 They seemed to really want to find a place to rest, but you know how shorebirds are -- when one bird gets antsy and takes off, they all go! 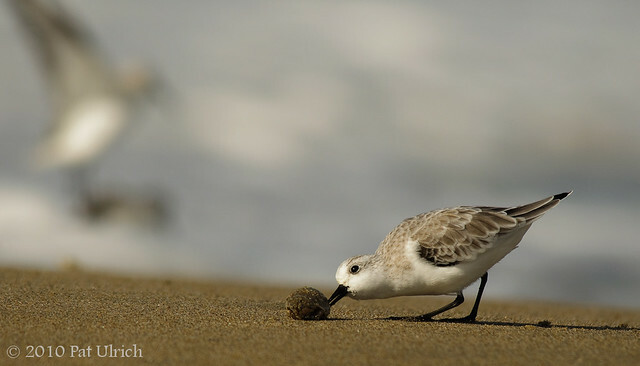 A sanderling checking out an arthropod shell along Limantour Beach in Point Reyes. Unfortunately for the bird, there didn't appear to be much edible material left. After picking at it briefly for a short time, it gave up and moved on. These shells are pretty common along the beach, although I'm not sure which species it belongs to (it's a bit more visible in the second shot below). 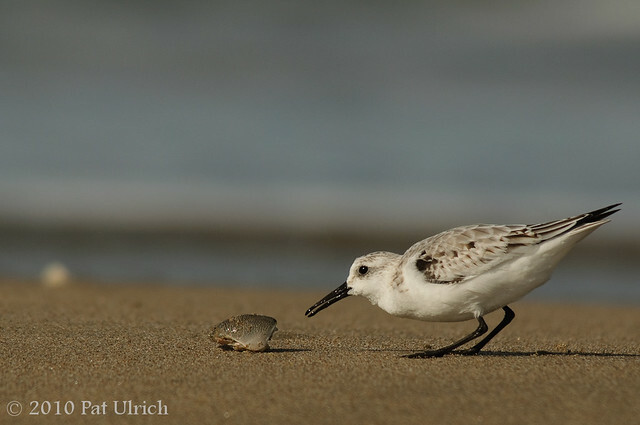 When I saw this shell in a nice place right above the water line with a flock of sanderlings working their way towards me, I decided to set up by it to see if the birds would be interested. 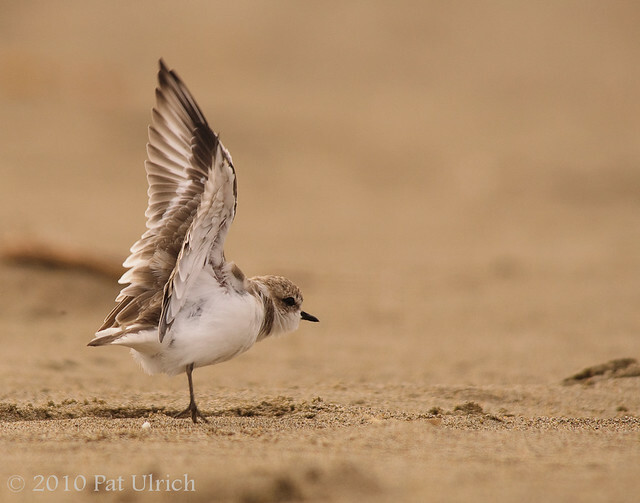 A few came close to it but decided not to stop, but then this one curious sanderling spent maybe 30 seconds or so investigating it. 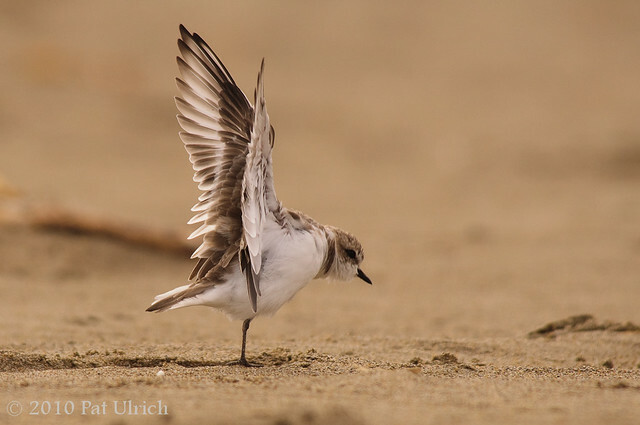 I was pretty happy with the potential of the shots like the one below, but when I was reviewing the images the top shot really stood out for me with the out of focus sanderling taking off in the background. It's time to stand up and celebrate -- congrats to the 2010 World Series Champion San Francisco Giants!! This was an awesome season filled with many highs and many lows that ended with a dominant postseason run, capped off tonight with the first championship since the franchise moved to San Francisco! Congrats Giants!!! 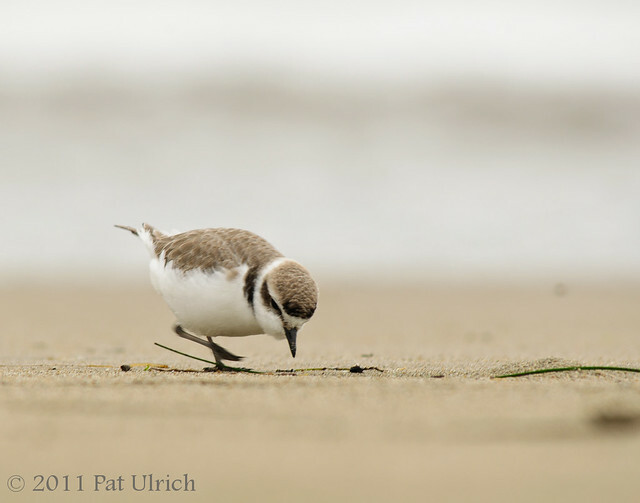 On a photography note, these "celebrating" snowy plover shots were taken along Limantour Spit in Point Reyes National Seashore in September. 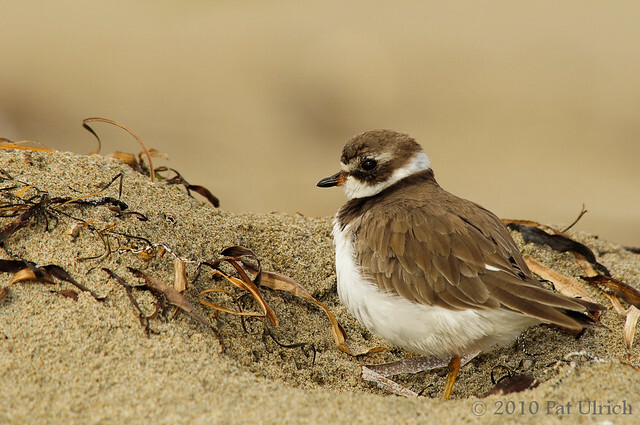 I spent a lot of time laying in the sand with half a dozen plovers, just waiting for them to do something interesting. I'd often see them stretch there wings from the corner of my eye, but it seemed hopeless to actually have the active one in front of my glass at the time. But my patience paid off, and I lucked out with two frames of this stretch. I like the tiptoed stance in the top shot, and the details in the wings in the bottom, and both seem to give off a feeling of happiness and celebration, so I was hanging on to them in my queue waiting for this moment to post them to celebrate the Giants winning the Series! Go Giants! As with every Monday morning, it sure would have felt nice to hit that snooze button one more time. 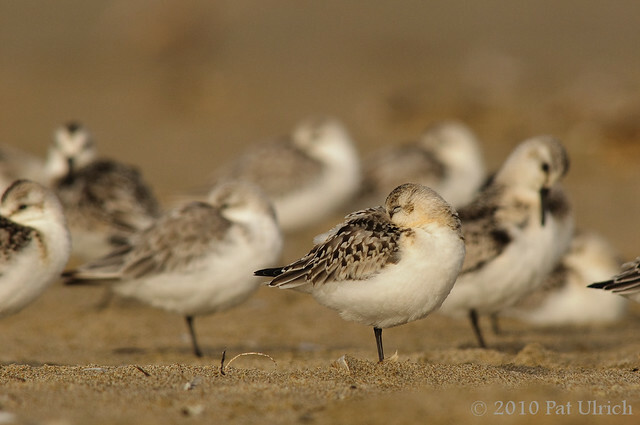 In honor of that feeling, here's a shot of a few sanderlings napping along Limantour Beach in Point Reyes National Seashore. This is a start of a good week though, with 3 chances for the Giants to win the World Series beginning with Lincecum on the mound tonight! And of course we have an election this week as well. For those of you in California, don't forget to vote Yes on 21 to fund our State Parks and keep these awesome wild areas safe and open to the public! More information can be found at this link. 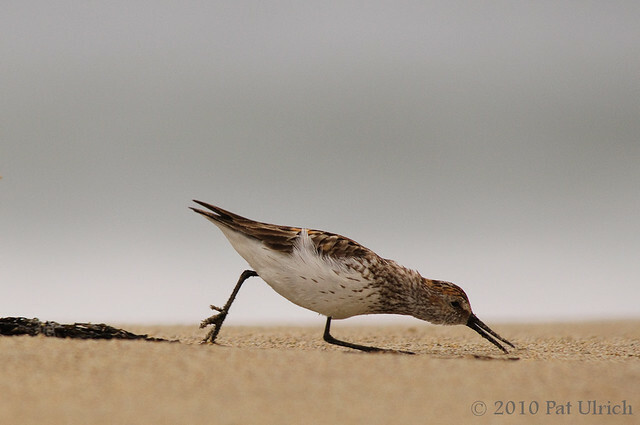 A western sandpiper stretching out to grab a bite to eat while on the run. 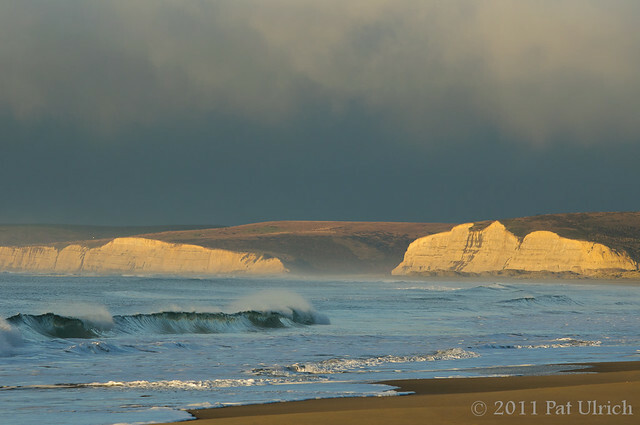 Taken along Limantour Spit in Point Reyes National Seashore. 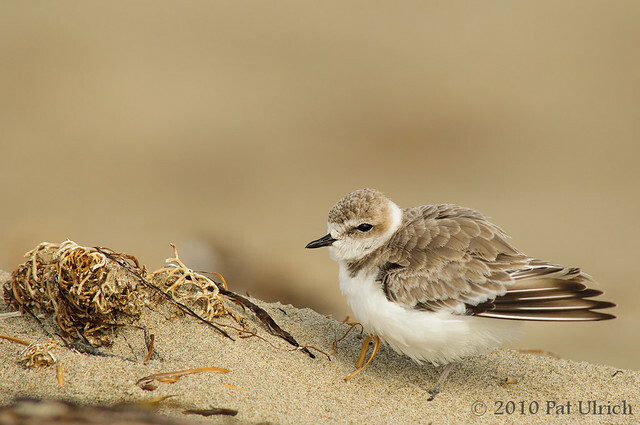 A western snowy plover in breeding plumage along the beach at Limantour Spit in Point Reyes National Seashore.